Boxer requires that fixed width fonts be used, so the Screen Font dialog box does not display proportionally spaced fonts. This is required, in part, to ensure that columnar selections can be highlighted neatly in rectangular blocks, and so that the Column Ruler can be used. These features would not be possible if the use of proportional fonts were permitted. The Font listbox at the left of the dialog displays the fixed width fonts which are available for selection. The Font Style listbox display the styles which are available for the selected font. Typically these are Regular, Italic, Bold and Bold Italic, although some fonts may not offer all styles. The Size listbox displays the sizes which are available for the selected font. The Script drop-down list displays the various character mappings which are available for the selected font. The color that will be used to display the font selected is controlled via the Configure Colors command. You may have need to display files which were created using a DOS program and which contain characters from the upper half of the ASCII character set. To display these files properly select a font which offers an OEM/DOS script style. One such font that is available on most systems is the Terminal font. At the time of this writing, the Internet site http://keithdevens.com/wiki/ProgrammerFonts contained good information about fixed width fonts, along with links to several screen fonts which could be downloaded free of charge. The Dina Programming Font is a very nice, free, fixed width font. Changing the Font Style selection from this dialog will cause the font style of 'Normal' text to be changed to the selected style. It will not alter the font styles of other screen syntax elements such as Comments, Reserved Words, Strings, etc. The Configure Colors command can be used to select the font style(s) for these elements, as well as for Normal text. For maximum flexibility it may be advisable to let the font style remain as 'Regular' in the Screen Font dialog and select the font styles to be used for Color Syntax Highlighting from the Configure | Colors dialog. The Screen Font is not used to print files; see the Printer Font command to select a font for that purpose. 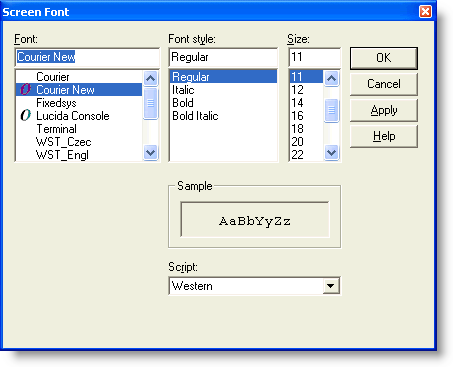 When selecting a True Type font, the standard Windows font dialog box may display a message at the bottom indicating that the selected font will be used for both screen display and printing. This message does not apply to the use of fonts within Boxer, since Boxer permits the Screen Font and Printer Font to be selected separately. The message intends to convey the idea that the font is capable of being used for both the screen and the printer.